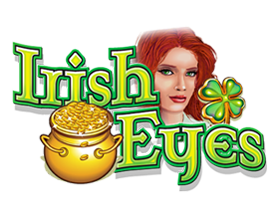 Where to Play Irish Eyes for Real Money? 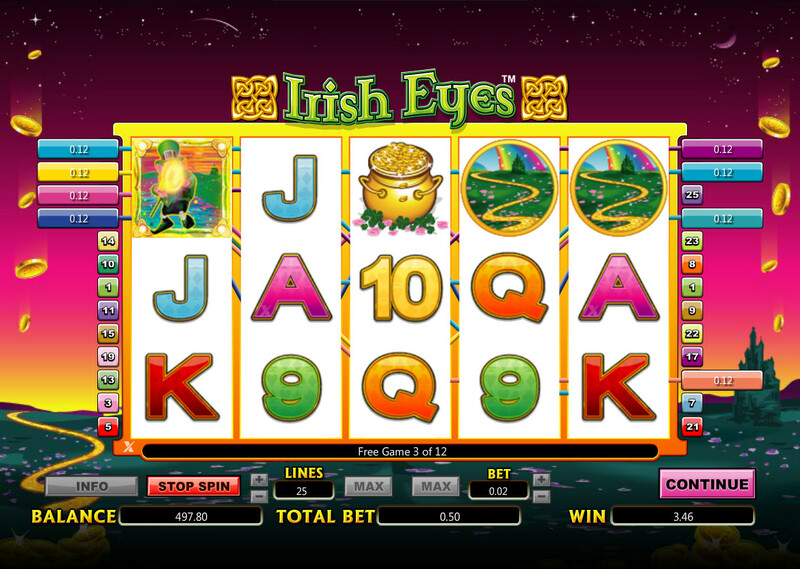 Will you have the luck of the Irish when you take a few spins at this slot from Nextgen Gaming? 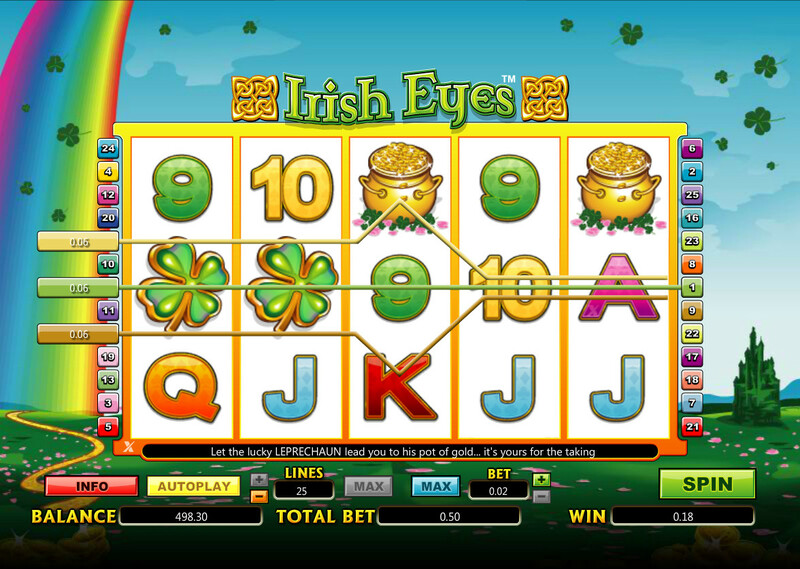 As soon as the game begins, you’ll realise that this is a pretty basic slot, without the spectacular graphics sometimes found at other online slots. This isn’t a bad thing though, and will really appeal to those looking for a pure gambling experience. 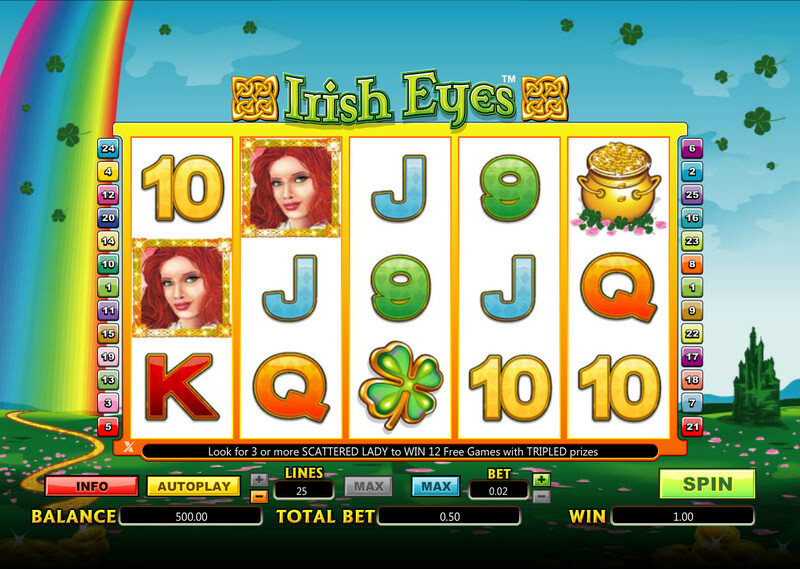 The reels are set against a pretty stereotypical Irish backdrop, which features a huge rainbow and four-leafed clovers falling from the sky, while the reels themselves are full of color and are almost guaranteed to bring a smile to the face of any players at this slot. The actual symbols mainly feature more stereotypical Irish items, such as a pot of gold, the four-leafed closer, and a leprechaun. The 10 to A symbols are pretty boring though, and Nextgen really could have done more to make them unique. When you get a win, you won’t see much in the way of animations, aside from the symbols popping out from the screen slightly. So, when it comes to the theme, this is a basic online slot, however many players will really like the stripped back way it’s been created. 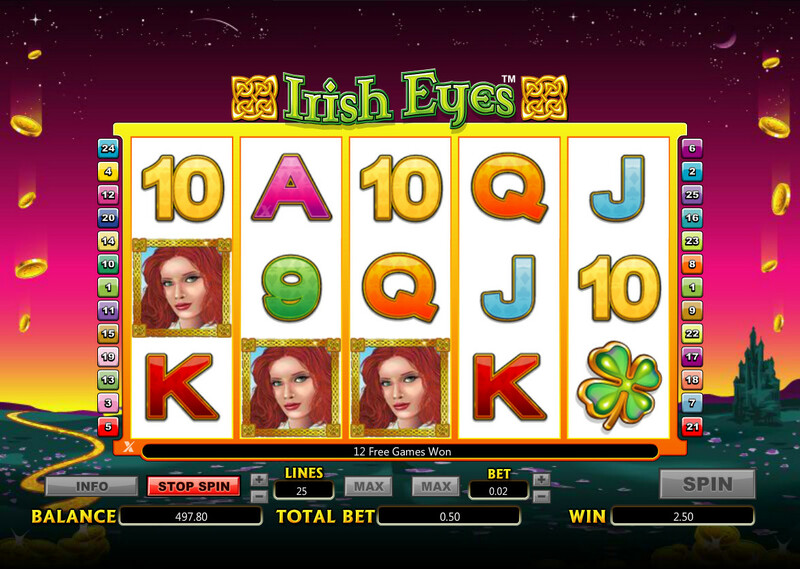 How to Play Irish Eyes Casino Game? 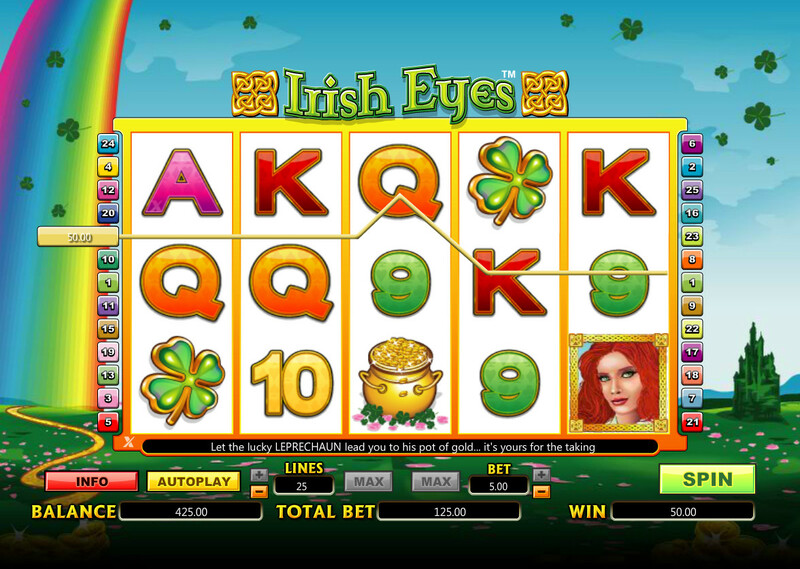 The gameplay at this slot follows on from the simplicity of the theme, as it really couldn’t be easier to play Irish Eyes. In fact, this could be one of the best slots around for new players, as it will really introduce them well to the basic features found at nearly all online slots. The first thing to do, as with most slots, is decide how many of the 25 paylines you want to play, and then you’ll need to make a decision surrounding how much to bet per payline. When choosing how much to bet, you should remember that bigger bets lead to the possibility of bigger prizes. Now it’s time to spin the reels – you’ll find the button to do this on the right side of the screen. Once the reels stop, you’ll discover if you’re a winner or not. There are also a couple of bonuses you could activate, and you’ll find out about them in the next section. 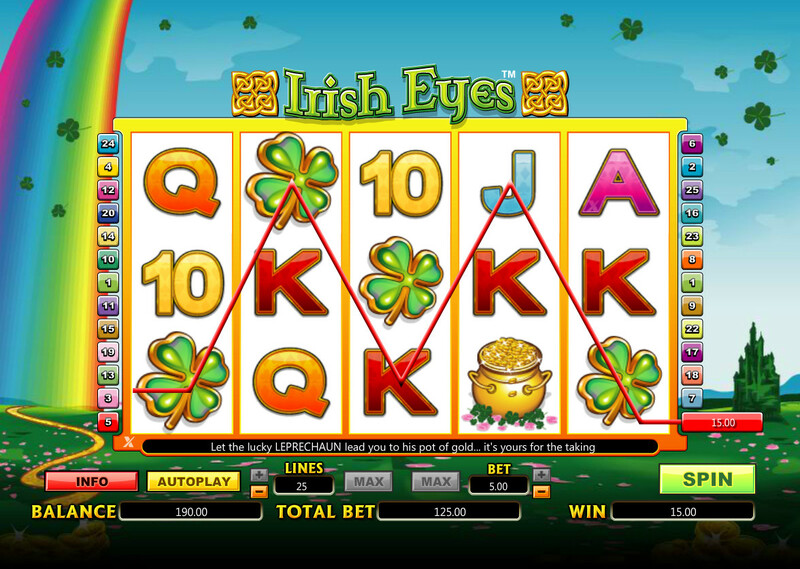 The most that can be won in a spin is 150,000 coins, which happens when you get five leprechauns during the free spins. Most of the time you’ll win smaller prizes though, which keep your balance afloat until a larger prize comes along. So, what about the bonus features at Irish Eyes? Well, the first thing to say is this: don’t expect to find huge numbers of them, which is in-keeping with the overall simplicity of this slot. The first one to mention is the scatter symbol, which is represented by the red-headed lady. The fact that this is a scatter symbol means that it pays out even when it is not on a payline. Unlike some scatter symbols though, it still pays left to right, meaning that the symbols have to be on consecutive reels. The red-headed lady is also important as getting three or more of her will lead to 12 free games being awarded. 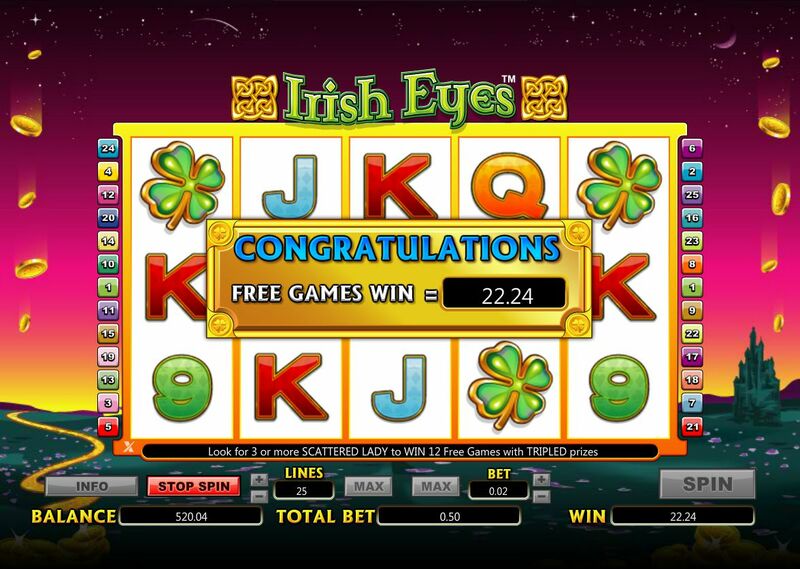 These are pretty standard in their form, aside from one important aspect: all wins during the free spins are tripled. Therefore, the biggest possible prizes are available while the free spins are active, so you want to activate them as often as possible! Then there’s the wild symbol, which is represented by the leprechaun. As with most other slots, the wild symbol can replace most other symbols on the reels, leading to some nice prizes. The wild symbol also leads to a bonus game, and this is activated when the wild symbol appears on reels one and five. During this bonus game, you’ll need to pick from the symbols to reveal a prize, with the maximum prize being 100x your triggering bet. It should also be mentioned that there is a Gamble game at this slot, which can be used after any win (aside from the jackpot). During this, it is possible to double or quadruple a win, however it is also possible to lose everything that has just been won. It is entirely down to you whether you use this feature though, however most experienced players will avoid it.